Acknowledgements. Preface. 1. State of the Art. Introduction. Tidal Energy. Wave Energy. Thermal Energy. Wind Energy. Current Energy. Biomass Energy. Salinity Energy. Geothermal Energy. Summary. 2. Offshore Wind Power Stations. Introduction. Historical Background. The Resource. Sites. Wind Power. Turbine Selection. Types of turbines. Harnessing Offshore Winds. Windpower and economics. Wind Farm. Implementation and Environmental Impact. Present U.S. WECS Program. Other Uses of Wind Energy. Conclusions. 3. Ocean Current Energy Conversion. The Resource Potential. Technological Development. Some Proposed Schemes for Extracting Energy from the Florida Current. Other Proposed Schemes for Harnessing the Energy in Ocean Currents. Environmental Considerations. Costs and Developments. 4. Solar Ponds. Introduction. Electricity Production. Background. The Solar Pond. Resource. Technology. Commercial Plant. Costs and Development. 5. Waves. Energy from the Ocean. Ocean Waves. The Potential Use of Wave Energy. Wind Waves. Historical Development. Wind Waves Power Harnessing. Transmission to Shore. Economics of Converters. Technological Problems. Environmental Impact. Prospects for Wave Power. Pumps. Conclusions. 6. Current Assessment of Ocean Thermal Energy Potential. Ocean Thermal Energy Conversion. Resource Potential. Regions of Potential OTEC Utilization. Historical Overview of the Technology and Basic Technological Concept. Summary of OTEC Research and Development Activities. Recent Design Concepts. Technology Research and Development. Environmental Research and Considerations. Cost Factors and Economic Considerations. International Legal/Political Considerations. OTEC Industry Benefits. 7. Is Tidal Power Coming of Age? Historical Background. Tidal Power in America. Tidal Phenomenon. The Resource. Tidal Current Power. The Tidal Power Plant. The Rance River Plant. Environmental Considerations. The Soviet Experimental Station. Small Tidal Power Plants in China. Tidal Power in Suriname. Tidal Power in the Bay of Fundy. Updating of the Bay of Fundy Project. Estimates of Project Cost. Financial Feasibility. Value of Tidal Energy. Projects Around the World. Advantages, Disadvantages, and Economics of Tidal Power. The Future. Tidal Power Twenty Years Later. Conclusion. 8. Salinity Energy. Salinity. Magnitude of the Resources. Energy Extraction. Technical Problems. Environmental Effects. Energy from Geothermal Brines. Energy from Salt Domes. Energy from Salt Pans. Current Funding and Problems for Research. Costing - electrodialysis plant. A Look into the Future. 9. Geothermal Energy. Geothermal Energy. Background. Resource. Technology. Exploration. Geochemical Characteristics and Exploration. Drilling. Dry-Steam Deposits. Power from Wet-Steam (Hot-Water) Deposits. The Total-Flow Concept. The Binary Cycle. Power from Geopressurized Deposits. Other US Sites. Power from Hot Tight Rocks (Hot Dry Rocks). Power from Magma Systems. Environmental Impact. Costing. Conclusions. 10. Marine Biomass Energy. The Resource. Plant Description. Seaweeds. Macrocystis Pyrifera. Marine Farms. Production and Productivity. Farm Design. Substrates and Supports. Artificial Upwelling. Harvesting Seaweed. Test Farms. Future Prospects. Electricity from Marine Biomass. Methane Generation. Glossary. References and Notes. Bibliography. Index. 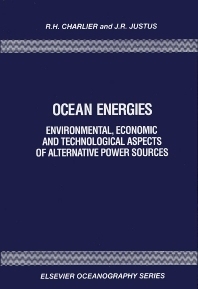 This timely volume provides a comprehensive review of current technology for all ocean energies. It opens with an analysis of ocean thermal energy conversion (OTEC), with and without the use of an intermediate fluid. The historical and economic background is reviewed, and the geographical areas in which this energy could be utilized are pinpointed. The production of hydrogen as a side product, and environmental consequences of OTEC plants are looked at. The competitiveness of OTEC with conventional sources of energy is analysed. Optimisation, current research and development potential are also examined. Separate chapters provide a detailed examination of other ocean energy sources. The possible harnessing of solar ponds, ocean currents, and power derived from salinity differences is considered. There is a fascinating study of marine winds, and the question of using the ocean tides as a source of energy is examined, focussing on a number of tidal power plant projects, including data gathered from China, Australia, Great Britain, Korea and the USSR. Wave energy extraction has excited recent interest and activity, with a number of experimental pilot plants being built in northern Europe. This topic is discussed at length in view of its greater chance of implementation. Finally, geothermal and biomass energy are considered, and an assessment of their future is given. Each chapter contains bibliographic references. The author has also distinguished between energy schemes which might be valuable in less-industrialized regions of the world, but uneconomical in the developed countries. A large number of illustrations support the text. Every effort has been made to ensure that the book is readable and accessible for the specialist as well as the non-expert. It will be of particular interest to energy economists, engineers, geologists and oceanographers, and to environmentalists and environmental engineers. @from:Marie-Claire Chaineux @qu:...the subject is of use to many different scientists, both natural and social, but will also fascinate the public at large.